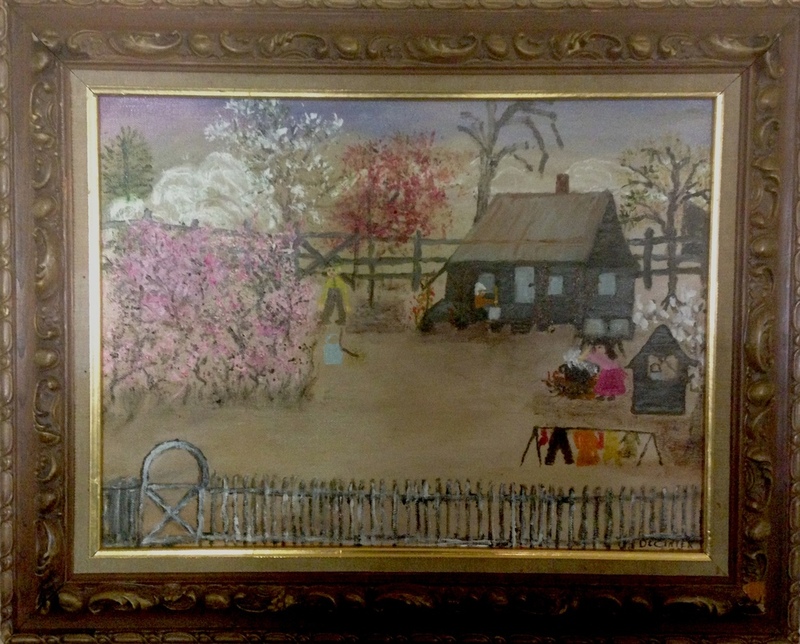 A painting by Mrs. DeCinter Farley depicting life on her family's farm in Claiborne Parish. Mrs. DeCinter Caraway Farley's certificate of appreciation for displaying for work in the Louisiana Folklife Festival held n conjunction with the 1984 World's Fair in New Orleans. Clothing was washed at the spring or over a boiling wash pot. Water was carried from the well for drinking and cooking. Cotton was picked, weighed, and baled. Beehives were tended, and then robbed of their chewy cones with the liquid gold encased. Fruit trees yielded luscious offspring for making jams and jellies. Fruit drying preserved some of the bounty for pies and cakes. Like the hog killing, the annual syrup making was a celebration partly because of the gathering of neighbors and friends, and partly because it produced a dark, thick wonder that hesitantly left the pitcher, and over hot biscuits had a taste like no other. From her memories comes a bittersweet footnote as she sums up her childhood: “I guess we mush have been very poor people, but looking back, I feel we were very rich.” DeCinter Farley died on November 15, 2008 at age 95. She is buried in Vienna, Louisiana, where she spent many years after marrying Cecil Farley. She served as postmistress of Vienna, where she began painting, and later lived in Farmerville on Lake D’Arbonne.